Gaps between the teeth are known as diastemas in the dental world. 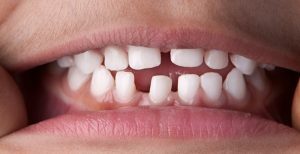 The most common place that gaps occur is in the upper front teeth, but this isn’t the only place a diastema can show up. There are a number of factors behind gaps between teeth. A difference in the size between upper and lower jawbones is a key factor. The size of teeth also plays a role. Teeth that are too large for the jaw will create crowding while teeth that are too small will create spaces and gaps. Misshapen or undersized teeth can lead to diastema, as can habits such as thumbsucking and incorrect swallowing reflexes, both of which push the upper teeth forward and create gaps. Gaps between teeth caused by either of these habits will expand over time, meaning they are more easily treatable than natural gaps. Without treatment, gaps caused by natural factors will remain at a similar size over the course of a lifetime – meaning dental intervention is the only way to remove or reduce the gaps. The best way to prevent gaps from occurring between teeth is to maintain a comprehensive dental health regime. Periodontal disease is a huge risk factor when it comes to gaps between teeth, so regular brushing and flossing is the best way to avoid any bone loss. Obviously, breaking bad habits such as bruxism and thumbsucking are important steps in keeping perfectly spaced teeth. However, if you have gaps in your teeth that are keeping you from feeling your confident, perfect best dhealth have the answers you have been looking for. Gaps between teeth can be caused by a variety of underlying problems. For some patients, diastema may be the result of chronic periodontal disease while for others it may just be an annoyance as the result of a single misshapen tooth. Braces: this is perhaps the most common way to treat spacing and crowding. It involves the use of metal or Invisalign braces to mould the teeth into the correct shape. Once the shape has been achieved the bite will be correct and the gaps between the teeth will disappear. Plates or mouthguards may be suggested for less severe cases. Crowns and Veneers: If your lateral incisors are too small you may suffer from gaps as well as other issues caused by an abnormal bite. Crowns and veneers are an incredibly effective form of treatment for this issue, as they serve to widen the teeth and eliminate the gaps. Implants, Bridges and Partial Dentures: In severe cases, gaps are caused by the absence of a tooth. In this case implants, bridges and partial dentures can help to alleviate the aesthetic problem this causes as well as keep the remaining teeth healthy and strong by restoring the functionality of the bite. Periodontal Treatment: If bone loss as a result of gum disease is the cause of the gaps the gum disease must be treated first. After the gum disease has been addressed the methods listed above can be used to cover the gaps and restore the bite.